In God We Trust License Plates Now Available! Representative Woody Burton led the effort in the 2006 Indiana General Assembly to pass legislation bringing about the creation of an “In God We Trust License plate”. Representative Burton was able to see this bill pass the Indiana House and the Indiana Senate and be signed into law. 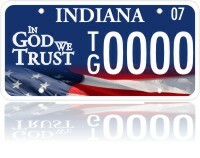 Individuals can now purchase an “In God We Trust License Plate” for their passenger vehicle at no additional cost. These plates are available at license branches around the state. Advance America supported the efforts of Representative Burton to create this new license plate and we were also involved in helping with the design of the plate.